Silky anteaters live in different forest habitats consisting of semi-deciduous forests, tropical forests, moist lowlands, evergreen forests, mangrove forests, and secondary forests. While sleeping, the silky anteaters are curled up in balls in the shade of vines or in the forest canopy (Hayssen et al. 2012). They are also arboreal and nocturnal, meaning they spend their days sleeping in trees (Nagya and Montgomery 2012). This is why they are specialized for forested areas. Many different species of ants are also present in the habitat of the Cyclopes didactylus as it eats around 700 to 5,000 ants a day including species from genera such as Camponotus, Crematogaster, Dolichoderinae, Pheidole, Procryptocerus, Pseudomymex, Solenopsis, and Zacryptocerus. Beatles are also prey for the C. didactylus (Hayssen et al. 2012). Cyclopes didactylus are found between sea level and 1,500 meters above sea level. They are found in parts of Central America and South America, specifically in Mexico down into Colombia, in southern Ecuador to the west of the Andes Mountains, and to the east of the Andes into Venezuela, Trinidad Island, Guyana, Suriname, French Guiana, Brazil, and Bolivia. A disjoined population can be found in Brazil in the northern Atlantic Forest (Hayssen et al. 2012). There are seven subspecies of C. didactylus divided by geography. 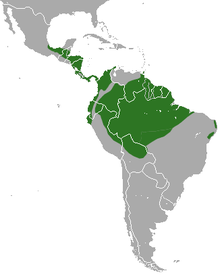 They are C. d. catellus (northern Bolivia, southeastern Peru, and western Brazil), C. d. didactylus (eastern Venezuela, Trinidad, and Atlantic Forest), C. d. dorsalis (very southern Mexico and northern Colombia), C. d. eva (western Ecuador and southwestern Colombia), C. d. ida (western Brazil, eastern Ecuador, and Peru), C. d. melini (northern Brazil and eastern Colombia), and C. d. mexicanus (southern Mexico) (Hayssen et al. 2012). Continue on to Form and Function!